The Hollywood Blacklist keeps showing up in the backstory of movies I watch, with Jules Dassin one of the egregious examples. Like a lot of people in the Depression, he joined the Communist Party and its promise of a brighter future, but quit the party after the Soviet Union signed a pact with Nazi Germany in 1939, an unforgivable betrayal for a Jew. Dassin was sent packing in 1950 after completing the shooting for Night and the City and didn’t direct another movie for four years. Practically penniless in Paris, he shot Rififi on a very low budget, with no stars and production personnel willing to work for lower wages just to observe a well-regarded director at work. 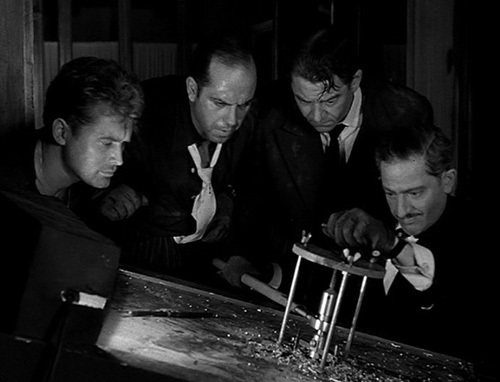 The result is one of the first heist movies, and one of the best. 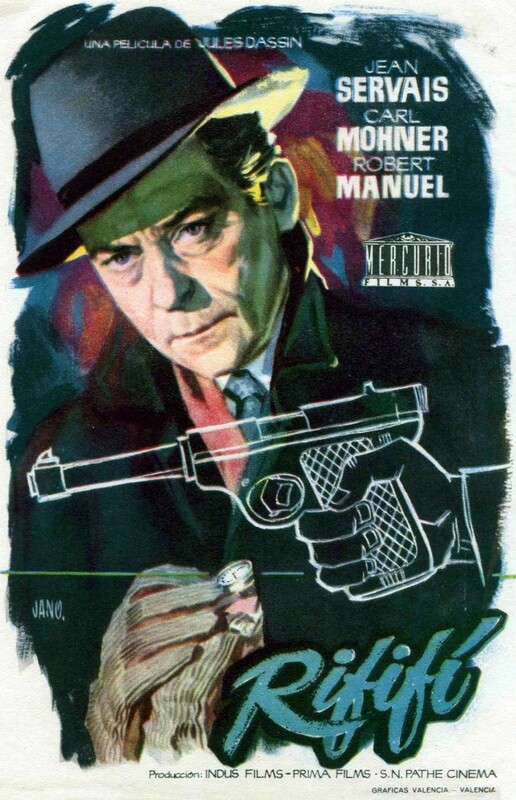 Rififi (we are informed this is French gangster slang for “trouble”) is largely the story of jewel thief Tony “le Stephanois” (Jean Servais) freshly out of jail after five years, having taken the rap for his younger protege, Jo the Swede (Carl Möhner), whose wife was pregnant at the time. Jo wants his old mentor to join him in a smash-and-grab job at a high-profile jewelry store. Tony’s response is they are instead going to burgle the jewelry store itself, considered a near-impossible job. The four man gang then proceed to meticulously map out the store, and the ebb and flow of its neighborhood. The heist, when finally enacted, is the centerpiece of the movie, a half-hour sequence without dialogue or music, incredibly tense and exhilarating. It is almost the perfect crime, but the romantic inclinations of the imported Italian safecracker (director Dassin himself) will doom the entire group. Dassin’s location shooting on The Naked City (inspired by the legendary New York photographer Weegee) stands him in good stead; the streets around the jewelry store become a character in themself. The loving attention to detail is apparent in the depiction of the seedier side of Paris and the criminal demimonde. Our merry band of thieves is likable, the opposing gang that sniffs out a chance for a big payday is vile, right down to kidnapping Jo the Swede’s young son, turning even Tony’s abused former moll against them. In many ways, this is the proto-Thief, and well worth watching. Doing something like proclaiming you are going to watch a certain 100 movies doesn’t give you the sort of leeway you normally employ in your movie watching, like the time I watched Head to observe Davy Jones’ passing, or The Ruling Class for Peter O’Toole’s. But when somebody stole F.W. 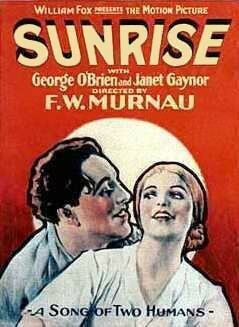 Murnau’s skull, I knew it was time to finally watch Sunrise. This is Murnau’s first American movie, made directly after Faust. The “Two Humans” of the title are a farmer (George O’Brien) and his wife (Janet Gaynor, wearing a bad blonde wig, but not as bad as the one Barbara Stanwyck was forced to wear in Double Indemnity), whose marital bliss is undone when a vacationing Woman From The City (Margaret Livingstone), sweeps the Man off his feet with her sophistication. She convinces him to sell his farm and come to the City with her – after he murders his wife by staging an accidental drowning. The Man can’t go through with the plan, and winds up pursuing his fearful wife into that City, where they rediscover their love on one adventurous, eventful day – but on the return home, their boat capsizes in a sudden storm, and the wife is swept away. 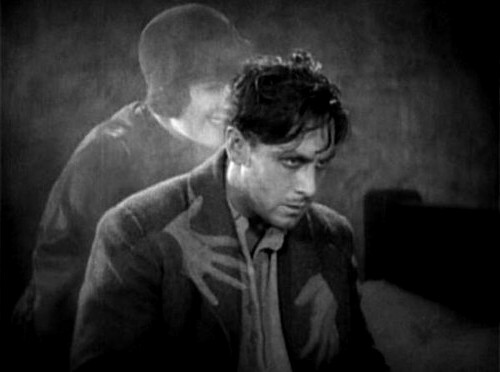 Like an earlier, highly-regarded silent, The Phantom Carriage, this is some heavy melodrama, but it’s good melodrama. The extremeness of the melodrama in Sunrise is more than matched and countered by the beautifully well-observed humanity of the middle of the movie, where we see the love of the Man and Woman rekindle itself. We can’t help but be swept along their journey, falling in love with them a little ourselves, which only turns the screws tighter in the storm sequence and its aftermath. This was the first movie to be released with Fox’s new Movietone process, which makes it the first movie with a prerecorded sync score and sound effects, extremely progressive while it was being made. There are two things that are going to lodge in your mind’s eye when you think over the experience, and both are in the City – not location shooting, but an actual, enormous set built by Murnau, and a huge entertainment complex with an equally huge music hall and restaurant attached. Again, a gigantic set built with all the trickery Murnau had mastered in the German cinema, employing forced perspective, midgets in the background to suggest scope, and a ton of extras. Sunrise has risen in critical estimation in recent years, moving into Top 100 Movie lists and even cracking a few Top Tens. Why haven’t more people heard of it, then? A month before Sunrise opened, another movie – The Jazz Singer – opened, and suddenly nobody wanted to watch a silent movie. It was talkies or nothing, and Sunrise was a financial disaster. Murnau would never again be offered the creative and financial freedom he experienced here, and this is a story we will encounter over and over again. He would only direct three movies before his untimely death in an auto accident in 1931, and cinema is much lessened for that. Then I watched a couple more movies you won’t hear about until October. Don’t worry, there’s still plenty left. Life is trying to crush me with deadlines (This month – July – is in fact going out with an increasingly grinding bang), so the only thing left to do was to go over to Rick’s and watch movies. Rick had been curious about this movie for some time, having only heard about it. That’s not too surprising; although incredibly popular in England, it sank like a stone in its American release. I had only seen it because it had a midnight showing in my college town. I guess it wasn’t Disney, so it wasn’t worth seeing. Based on the novel by Richard Adams, Watership Down is the tale of a group of rabbits fleeing the destruction of their warren, foretold by the Cassandra-like prophet bunny, Fiver (voiced by Richard Briers). Their leader, Hazel (John Hurt) turns out to be quite adept in his new role, and they eventually, after many adventures, take up residence on a high hill, content until they realize that they have no women, and the new warren will eventually vanish. Thus begins another thread of the tale where the largest of the fugitive rabbits, Bigwig (Michael Graham Cox) infiltrates the warren of General Woundwort (Harry Andrews). If their former warren was a bit of a fascist outfit. Woundwort and his minions are absolute Nazis. Their captive population cannot reproduce because it is too crowded. Bigwig seeks out a feisty doe who has helped other rabbits escape, and a daring nighttime breakout ensues, aided by the errant gull Kehaar (Zero Mostel, in his final film role), and a boat, a man-made object that Hazel’s clever warren has learned to employ. The story’s not over yet, but that’s for you to experience yourself. As you probably noticed, this is an adventure story where the characters all just happen to be rabbits. 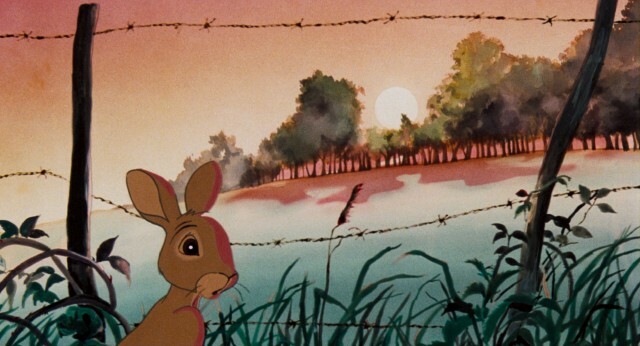 Watership Down is held up as a sterling example of how to adapt a novel to screen, rearranging events and deleting others for the sake of the movie’s general flow, while remaining largely faithful. It is also known as the most violent PG movie ever released – there is never any doubts as to the stakes being played for in the rabbits’ quest, and, well, there will be blood. I’m okay with that, a lot of parents with crying children were not. The British Board of Film Classification apparently was still receiving flak every year for giving it a “U” for “Universal” rating, the equivalent of a G.
This begs the question as to how much about the brutal nature of life should children be shielded from, and for how long. My own childhood is still bright and terrifying with images of animals being slaughtered for the rural dinner table. That’s not an experience a lot of children went through, even in my childhood. In our increasingly urbanized existence, that number is likely even lower. But we’re here to talk about movies, aren’t we? It ain’t Disney. Though it may look like it, with its multi-plane animation and watercolor backgrounds, it ain’t, and really, it’s much better for that. I’m going to go further, and grumble about the misconception that if it’s animated, it must be for kids, and kids alone, a misconception that endures despite all the boobies Ralph Bakshi and the Heavy Metal movies have plastered across movie screens. 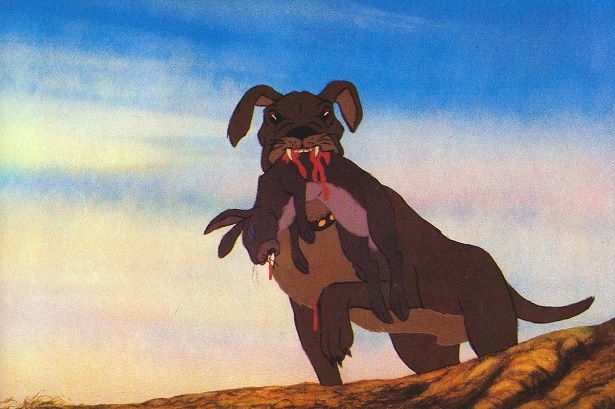 Research also dug up this, which again makes the above mistake: the follow-up to Watership Down, also based on a novel by Richard Adams, The Plague Dogs, is a cartoon for children like Salo is a movie for high school history classes. 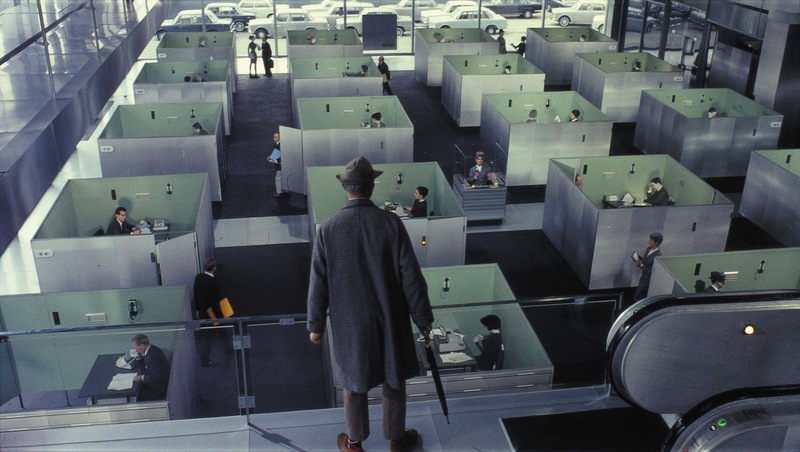 Our journey through Jacques Tati‘s oeuvre continued with this, generally acknowledged as his masterpiece. After the international success of Mon Oncle (my personal favorite), Tati used his resulting clout to make what would become the most expensive French film to date, about 2.5 million blooming to over 15 million – in 60s currency – over the course of a three-year shoot. This is the sort of movie-making legend where it is tempting to obsess over the production of the movie rather than the film itself. Tiring of his M. Hulot character, Tati sought to de-emphasize him with more of an ensemble, a tapestry of characters we follow throughout. 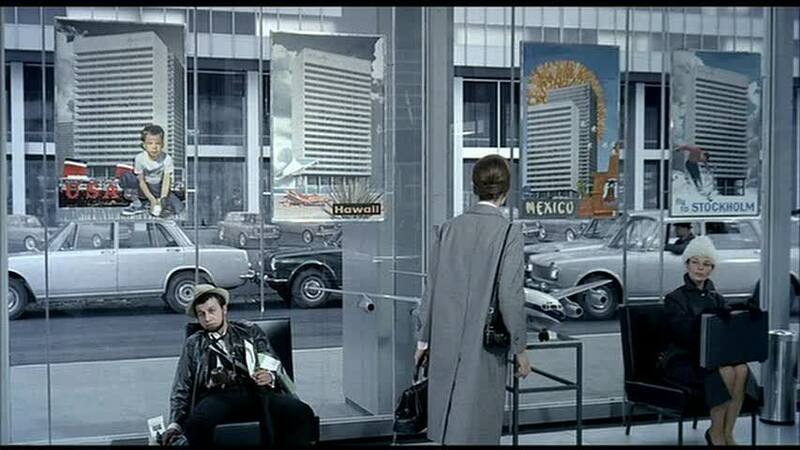 Hulot spends the first part of the movie trying to have a meeting with an elusive man in an ultra-modern labyrinth of an office building, eventually becoming swept up with a group of businessmen in an international product expo in another building entirely. His fate is shared by Barbara (Barbara Dennek), a pretty young American who wants to see the true Paris, but is swept along with her group of tourists into the same shopping expo. Tati’s usual bemusement with problematic modern technology and consumerism is given full play here, leading up to one of his most complex and lengthy setpieces ever, possibly even in cinema as a whole: a pretentious restaurant called The Royal Garden, which opens even as the workmen are putting the finishing touches on, well, everything. 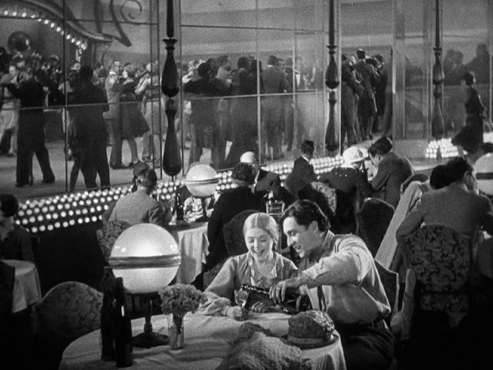 The evening becomes ever more crowded and chaotic – practically every character introduced in the opening scenes shows up – even as the hastily-finished building begins to collapse around its patrons. It is only when the restaurant begins to fall apart, when the pretensions disintegrate, that the space becomes more perversely human, and the people inside begin to genuinely enjoy themselves. This argument against overly-structured modern life is echoed in Hulot’s perambulations, where he finally meets the man he never managed to at the beginning, but only when that man is out walking his dog in the evening. That we later see the two part jovially at the beginning of the restaurant sequence, their business apparently concluded, is a rare moment of accomplishment for the perpetually unlucky Hulot. Tati set out to make a movie where it was impossible to catch all the jokes at one viewing, that the wandering eye would see something in every nook and cranny of the scenes. It’s like those crowded panels of Mad, drawn by Bill Elder when it was still a comic book. You could fill a book with observations on Playtime, and still not be sure you got it all. 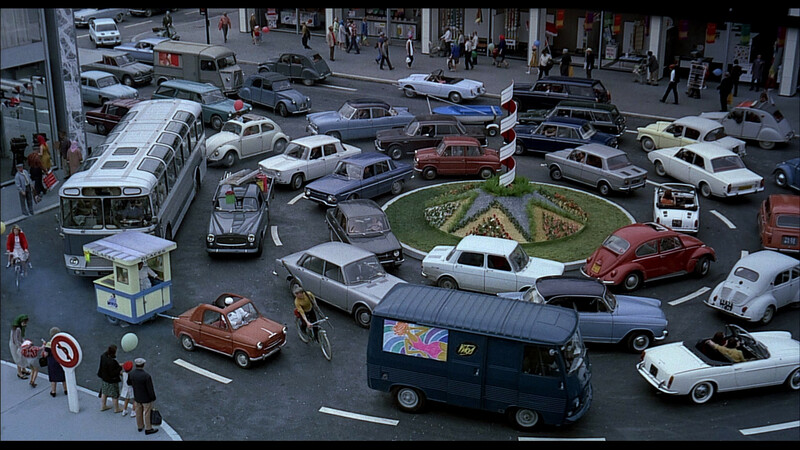 As ever, the sound effects are practically half the movie: Tati’s soundscape renders every object onscreen alive. Structurally – and trying to append a structure to Playtime is a mug’s game – it is most similar to Jour de Fete, a lengthy, multi-charactered lead-up to a frantic, hilarious third act, then a cooling-down sequence leading to a melancholy, but touching conclusion. It’s the lack of conventional structure – and probably the comparative lack of Hulot – that made the movie tank horrendously on its release, and Tati – in considerable, ruinous debt – saw his life’s work auctioned away. Like Murnau, he would only make two more movies in his life, and both of those were commissioned work for television. Never again would he have the free rein and freedom given him here, and whether or not that is a good or fair thing is not for me to judge. 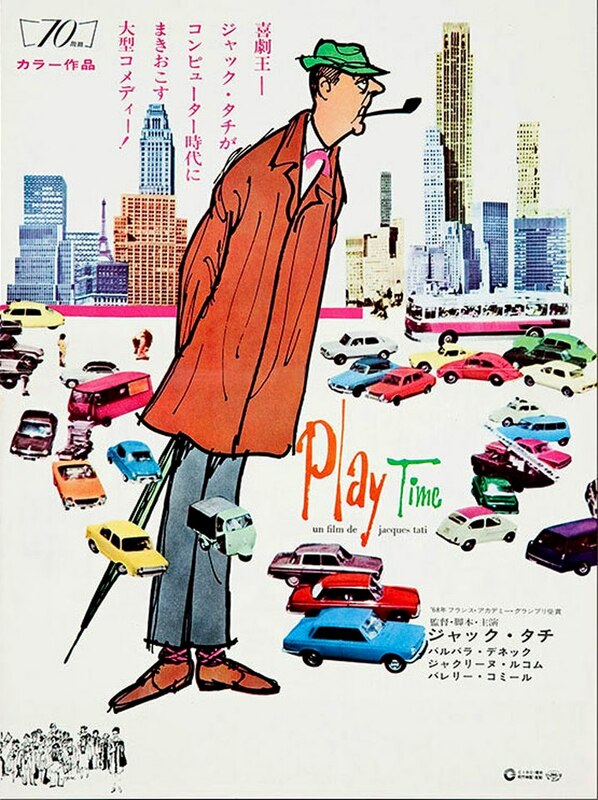 With Playtime, Tati attempted to take his game to the next level, and produced a movie that is undeniably ahead of its time. The thing is, I don’t think that, even now, the world has yet caught up with Tati. Wow. Sunrise and Napoleon were both torpedoed by The Jazz Singer. Another crime laid at the feet of blackface. Or technical breakthrough over cinematic storytelling. Two films near and dear to me. Sunrise is one of my favorites, and the scene I never shook was the tram ride into the city, with the fearful wife and desperate husband completely frozen and focused on each other as they go from country to town to city. I managed to get the Fox special edition DVD off of eBay, but the best showing I ever saw was at the Charles Theater, accompanied by the Baltimore Symphony Orchestra. 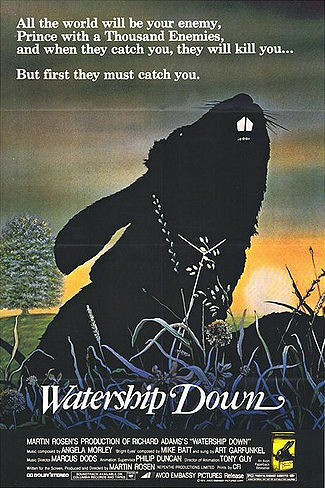 My first encounter with Watership Down was probably typical. It was on pay cable in the very early 1980s, and I remember coming down to the family room while my Mom was watching it (probably scouting it out considering its rating). Since she hadn’t seen anything out of whack with it and most of the movie had rolled by, she figured the rating was overblown and I joined her. This was right before the escape from Efrafa. The next thing I remember is Blackavar’s throat being ripped out and spinning my chair away from the tv, crying “Whaaaaat? !” And that image of the dog above remained burned in my brain until I finally got around to reading the book and becoming obsessed with it. Which of course made me return to the movie, which I now love. It’s kinda like Willy Wonka and the Chocolate Factory. That movie is essentially a serial killer flick for kids, and every brat’s disposal frightened me so much on the first viewing that I left the room during Veruca’s song ’cause I knew she was next. But after that first viewing, it became an annual favorite. 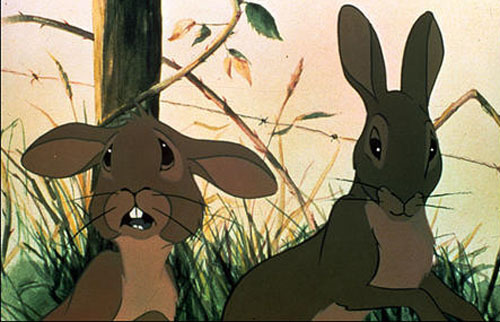 The real issue with Watership Down is that 99% of its graphic violence is packed into the climax. Outside of that, it’s a pretty pastoral adventure, with occasional bouts of creepiness and dreamscape visuals. Violet’s death by hawk is done in quick cuts and generally off screen, and while Bigwig’s encounter with a snare is pretty scary, he escapes. Unlike poor, raggedy and beat upon Blackavar. It’s like the movie lulls you into a waking dream, and then smashes a baseball bat with barbed wire over your head.